If you’re looking for ways to dress up your dining room for the holidays, nothing works better than some good, old-fashioned trim detail. If your home already has historic holding elsewhere, you can usually find the same or similar stock at your local lumberyard. If not, some will make knives to reproduce your molding exactly and offer drawings that explain how to combine several elements — from triple crown moldings to chair rail and base — for maximum effect. Historic designs for plaster details are making a comeback in new, lightweight polymer reproductions. 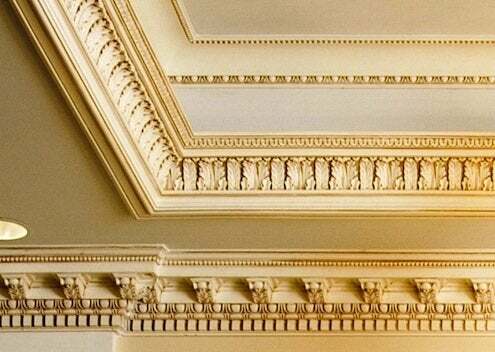 Lightweight and easy to ship, missing or damaged cornice moldings, friezes, corbels, brackets and ceiling medallions are easy to cut and install, and they hold paint well. For a really big impression in the dining room, try building a china cabinet into a corner or a closet. In a couple of weekends, you’ll have a dressed-up but very practical conversation piece!